Kaka at Fuchsia Walk, Oban. After a night in the DoC hut at Mason Bay (which included a very close encounter with a kiwi, at about 1am just as we were about to give up searching) we hiked across the interior of Stewart Island to a landing jetty on the Freshwater River. The plan was for a water taxi to pick us up and take us back to Oban with a stop-off at the Ulva Island bird reserve on the way. It was an hour past the scheduled pick up time when the small boat finally appeared around a bend in the river, and once we were aboard the skipper explained that he’d been fighting against a strong headwind and 2m swells all the way from Oban. With the wind behind us, the journey back down the Paterson Inlet was much quicker but still a pretty intense experience, and it was clear that a landing on the exposed shore of Ulva Island wasn’t going to be an option. Even tying up to the jetty in sheltered Golden Bay took several attempts and all of the captain’s skill. Fuchsia Walk sounded to us like the kind of name you’d give to a street in an English housing estate in order to make a row of identical brick houses sound exciting and Mediterranean. It came as quite a surprise when we turned off Golden Bay Road and found ourselves on a winding path, leading down flights of steps into a narrow ravine filled with wild fuchsia bushes. The tops of the trees still thrashed around in the gale, but down at ground level the air was almost still, and filled with the best Bellbird and Tui song we’d heard since arriving in New Zealand. We dumped our bags by the trail, Li-Li grabbed her camera and telephoto lens and I got out my sound recorder, and we each set about capturing the scene in our own way. After a few minutes a new call entered into the mix, one we hadn’t heard before. It took several more minutes before we were able to spot the source, a large, dark coloured parrot hopping along a branch overhead. 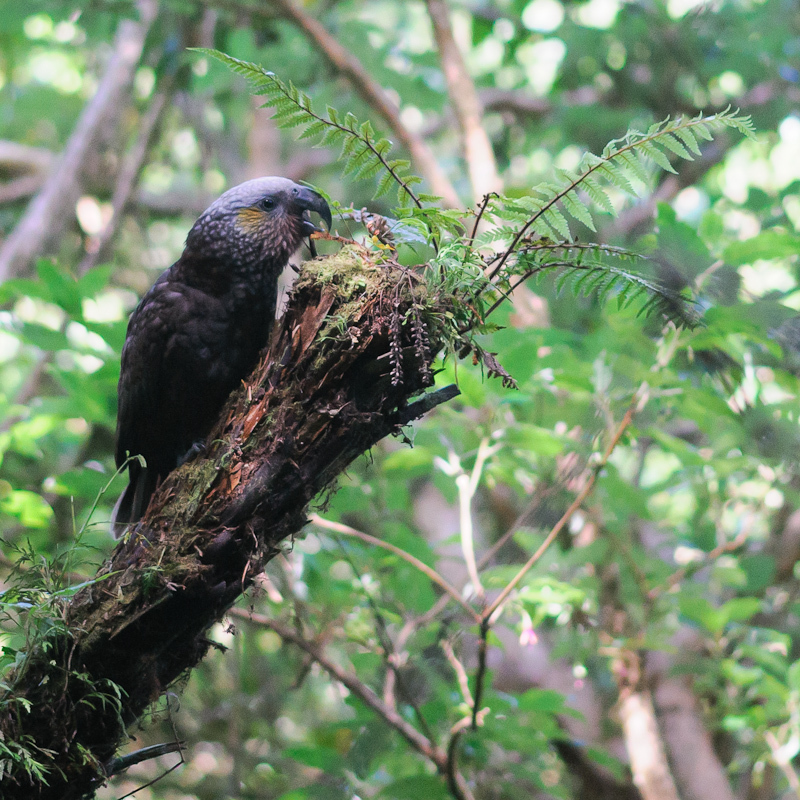 Just as we were congratulating ourselves on our first sighting of a Kaka, another appeared… and another. Within a few minutes there were at least 8 of the birds in the trees all around us, and they gradually became more and more curious, swooping right over our heads as we watched them. A local passing by told us they often get fed in that area, and when we made our way into Oban we spotted them all over the town. This recording, made with the built-in microphones on my Sony PCM-D50, captures a few minutes of life on Fuchsia Walk, with the wind rushing through the trees overhead.